Ini "I told you a few backs that my relationship is still intact. Anybody who wrote a story that I have dumped my man will still rewrite it, because I cannot dump my man. Who will I dump him for? I heard they went as far as fixing a wedding date, how can people fix my wedding date for me? I have never mentioned a date to anybody. They kept quoting a particular person who they claim is very close to me, and that the person gives them information about me. I am wondering who this close person to me is who cannot tell them the truth about Ini Edo. I am not married yet and I have not dumped my man. I cannot dump"
"The most recent one was at the City People Fashion and Style Awards , where I was selected among the best 10 well dressed men. After a while, someone walked up to me saying, "Hello, are you the champayne guy?" I was short of words. 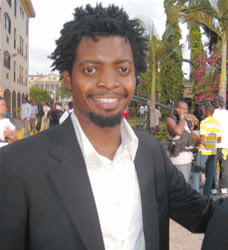 That is one of the reasons I find it difficult to wear bow tie again, especially red and black"
Ace comedian, Basketmouth, has acquired a multi-million naira mansion in Lekki. Sources say the comedian bought the house for about N100million few weeks after he signed a multimillion naira endorsement deal with Globacom. In a chat with Basketmouth last week, he confirmed he bought the house lately but has not moved into it for certain reasons. Asked about the cost and location of the house, he said "Please, make we drop that one for now"
Good for Basket, he works hard enough. This might come as a heart break to many of his teeming fans but the truth is that the talented rapper is quitting music for real. "It is true that I am quitting music and that will be after my third and last album is released. The reason I am quitting music is because I want to concentrate on my record label, Rugged Records, my clothing line and the new artistes I have on my label. I might not want to mention the names of the artistes I have on my label but before the end of the year, their singles will drop. You know I have so much on my hands and I am the one doing all myself, so I need to quit music to concentrate on other things." For some reason, I don't believe this. Didn't Jay Z pull this on us? Anyway, Goodluck to Ruggeddybaba. 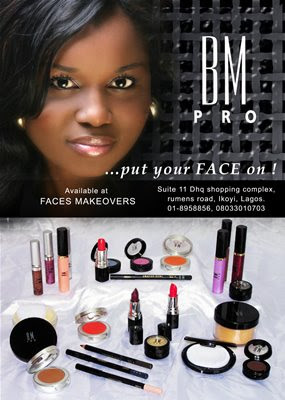 Presently surfing in Atlanta enjoying her 9 months course, top make-up artist, Banke Meshida-Lawal has yet again struck another first and this time, it is about a whole new range of beauty primers and skin enhancers. The Hypo-allergic range provides sun screen and anti-oxidants protection and ultra sensitive needs, mattify, smooth, ensure make-up stays on longer and aids in flawless application and finish. Oil free formula with micro diffusers to keep skin looking flawless. Soon to be launched. A video production company in Lagos, Nigeria, is looking to hire afull-time video producer. Ideally, the applicant should be young andexperienced in producing exciting TV programmes, documentaries etc. If interested, please send a curriculum vitae to the following email address :imaginari@ymail.com. Only shortlisted applicants would be contacted. GRAND ARRIVAL FOR THE FUTURE AWARDS 2009! You would be forgiven if you thought you were at any of the major Nigerian awards; not just a launch. There was glam, there was glitz, and there was a blinding array of stars as Season 4 of Nigeria’s biggest youth event, The Future.. Awards, was launched in Lagos on the 30th of September. The venue was rave new place, Studio 868 in Victoria Island and the action started right from the exclusive Nigezie green carpet as cameras clicked away and guests sipped from their cocktail glasses. The guests were welcomed into the venue by the anchors, Cool FM’s Gbemi Olateru-Olagbegi and ace comedian, Jedidiah. Then the show kicked off with comedy and a performance by rave new guitarist, Bez Idakula. This was followed by a special post-humous tribute given by Prof. Pat Utomi in honour of late Board of Trustees member, Prof Jadesola Akande – the award was presented to her son, Debo, by Ms. Bennie Uche. The event saw spectacular performances by Omawumi of Idols West Africa, whose new single, In the Music, got the guests screaming and swaying; ace rapper MI, who ‘set the roof on fire’, and the Rooftop MCs who took it to another level with their mega-hit track, La gi mo. Unveiled at the occasion during a presentation by the event’s PR Director, Emilia Asim-Ita, were the new logo and the new website. Also unveiled was the ‘i am the future’ campaign which is the theme of the entire media campaign for the awards – TV, radio, print and outdoor; working with brand ambassadors; Gbenga Sesan, IK Osakioduwa (Wildchild) and Tara Fela-Durotoye, who are the only three people to have won twice at The Future Awards. Nominations were also formally declared open as from 12 midnight on that day: the awards have been expanded from 15 over the past three years to 20, and the judges were unveiled to include Mo Abudu (Moments with Mo), Bolanle Austen-Peters (Terra Kulture), Siene Allwell-Brown (Nigeria LNG), with Dr. Reuben Abati remaining its Chair. Guests at the star-studded party included Stella Damascus, Michelle Dede, Tara Fela-Durotoye, Bukola Adubi, Toni Kan, Ebuka Obi Uchendu, Funke Bucknor, Soundcity’s Onyinye Igwe, the winners of Nigeria’s Next Top Model with the organizer Joan Okorodudu, Big Brother’s Ofunneka, Najite Dede, amongst others. The train now moves to the national tours, which will take the Awards team to town hall meetings in Abuja, Kaduna, Enugu, Ibadan, Benin and Lagos to engage the youths at the grassroots. Nominations are to be submitted via the website and by phone and close on the 31st of October. 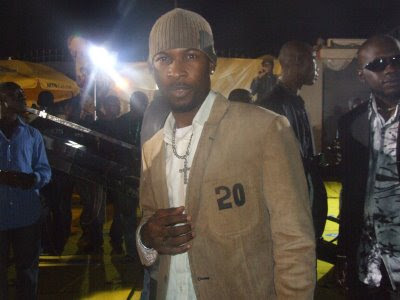 The date of the Awards proper was also unveiled to be the 18th of January, 2009, in Lagos. This launch event was held with support from Macleans, Yvent Couture, Zapphaire Events, Nigezie, Total Consult, O’Naphtali, Royal Mega Printing, Wea Concepts, Tremor Perfect, Saheeto, La Bash, and Nigeria International. I told you guys they gave me a surprise party at the office on my birthday. I came back from choreographing a fashion show on that day, after driving in traffic for more than an hour from the Island to the mainland. I was tired and grumpy, only to get to the office to find a few friends and guys I work with screaming HAPPY BIRTHDAY!!!. It was a beautiful time for me...check out some pictures from the party. 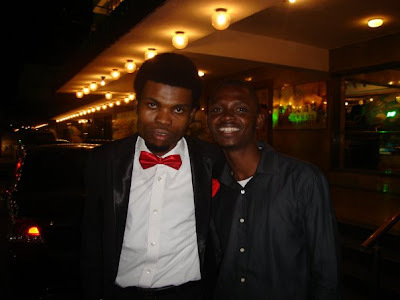 With Oteri Agboro, the second funniest guy I know. Ever wanted hair like Mary J. Blige, Beyonce Knowles, Tyra Banks and the whole lot of them? Attend Hair Beautiful's Lace Front Wig Party on October 5th and you will learn the secrets to the art of the Lace Front Wig. Hair Beautiful is an international hair company owned by Ireti Dada. Hair Beautiful will be launching its first ever Wig Party in Lagos Nigeria on the 5th of October at Eko Hotel & Suites in Victoria Island from 12 noon – 8pm. The wig party will be the first of its kind in Lagos, giving women the opportunity to learn more about Lace Front Units, purchase units, ask questions and socialize. Lace Front Units: are hair extensions that create the illusion that hair is growing out of ones scalp and therefore is one of the most naturally looking extensions on the market. In the words of Ireti Dada "come to our wig party and learn all about it, you probably would never wear a weave again." Come and experience quality hair, Remy Human Hair, Brazilian Hair, Malaysian Hair and more. There will be a varied selection of Lace Units, accessories and Hand Tied Wefts to purchase. For those of you ready to look fabulous for the week ahead, come ready to have your lace units installed in a private suite. See you there and be sure to bring a friend!!!!! Adandiigbo Beauty Pageant a high profile, non swimsuit beauty pageant introduced to celebrate the beauty and the virtues of the Igbo maiden, enters its fourth edition in a grand style. This reputable beauty pageant had its debut in All Seasons Hotel, Owerri in 2005 and was won by Ndidamaka Nwosu. The second edition took place at the exquisite Hotel Presidential, Port Harcourt in 2006 and was won by Onyinye Nwosu and the third edition won by Chisom Ibe took place at the prestigious The Balmoral event place in Lagos and now the journey continues to Enugu State at the serene environment of the Protea Nike Lake Resort for the fourth edition slated on 29th November, 2008. As the pageant journeys to Enugu, the coal city, it now goes as a full festival known as Akaraka Fiesta: a harvest of Igbo arts and culture. This festival which will have the Adandiigbo Beauty Pageant as its grand finale will showcase the rich cultural heritage of Ndigbo. This is with the aim of fulfilling the objectives of identifying things that brings us together as a coherent and integral culture group with a distinct attribute and highlighting this unique paraphernalia in the face of contemporaneous debilitating influence of western culture and its eroding effect. The success of the Akaraka festival will no doubt keep the Igbo culture refreshingly alive and make it a resounding tourist attraction and destination for all. The festival is billed to highlight all the facets of Igbo life in a nine days carnival. Ndiigbo home, in Diaspora and friends will be opportune to be treated to the celebration of the rich cultural heritage that will rekindle old glamour and set their passion aglow. This will regenerate the pride and trust of Igboness again. Adandiigbo as part of the carnival will still continue to serve its purpose, which is to provide an avenue for our queen to be an ambassador for our culture, peace, development and also serve as a voice for the young maidens in main stream issues that affect their daily lives as well as building bridges across ethnic divides. Enugu State, no doubt, will serve as a melting and unwinding pot as the festival holds. The festival which will start with a press conference will also have other activities on a daily basis. These activities includes traditional dance and masquerade presentation, all night music show, Igbo pot, a display of the culinary prowess of the people, arts, historic and pictorial exhibition, fashion parade, weaving and basketry, lectures, awards and so on. This festival will enhance Igbo distinct perception of life as a continuum, moral control systems, republican attributes, strong religious beliefs, consensus decision making process, commercial inroads and love for agoraic way of life. It will treat the attendant audience and guests to the sights, sounds and traits that are uniquely Igbo. 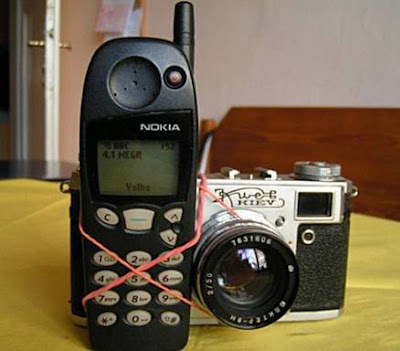 Igbo kwenu!!! The Central Working Committee for The Future.. Awards has announced the start of the next season of Nigeria ’s most respected youth event. The website, http://www.thefuturenigeria.com/ has the bold announcement on its page: ‘The Future Awards 2009 unveils on the 1st of October – Get Ready Nigeria’.Christened ‘Africa’s biggest youth awards’ by the London Metropolitan University last year, the 4-month long project which is in its fourth year goes beyond the Awards itself, encompassing the national road shows, and various pre-events and conferences all geared towards inspiring young Nigerians.